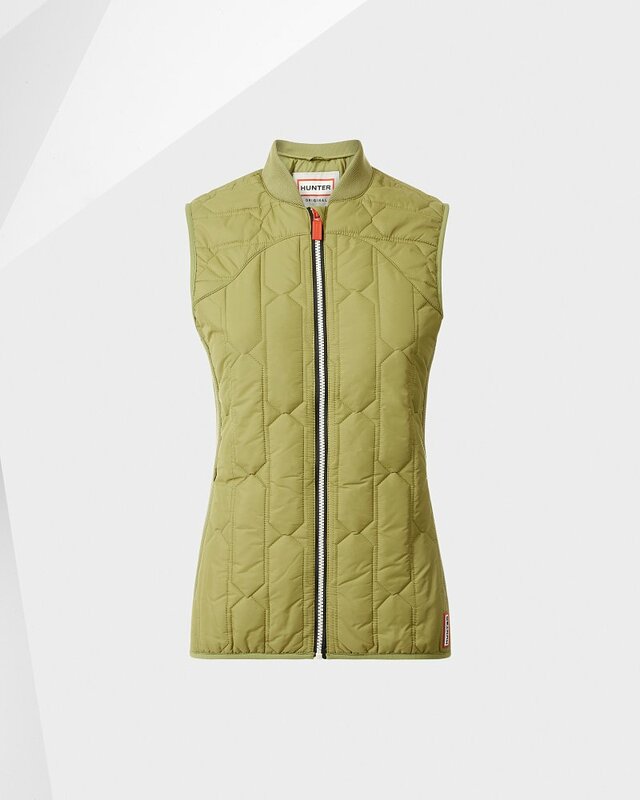 Women's Original Midlayer Gilet is rated 4.2 out of 5 by 5. Nueva adición al Core Concept de Hunter Original, el chaleco Original es ligero e impermeable para un clima impredecible, con el acolchado de unión en la parte superior distintivo de Hunter. Rellenos con plumón ligero y sintético, los paneles laterales de varillas elásticas en los orificios de los brazos garantizan un ajuste seguro y proporcionan más protección ante los elementos. Para comprobar la conversión de tallas y las medidas del cuerpo, consulte la guía de tallas anterior. Rated 4 out of 5 by AFloridaMom from The pink is a little too bubble gum-ish Nice vest and very warm. It was cold in Florida in low 40s last week and I managed to wear this on top of my thermal shirt and a cotton turtleneck without feeling chilly. But the pink is a little too bubble gum-ish than the color shows on the model in pictures. I am in my late 30s. Even though I still look very much in my mid 20s and totally could carry the pink, yet I find myself having a hard time to style the pink vest to make it age-appropriate. Otherwise, nice fitting with awesome details. Rated 5 out of 5 by PS SD from Great color and fit! Just as the previous reviewer, I ordered this in the medium, although I'm usually a small and the fit was spot on. For reference I'm 5' 3" and 139 lbs. So I suggest you order up so you can layer. The color is beautiful and matches my pale rose hunter boots. Rated 2 out of 5 by K38! from Funny fit I loved the navy color of the vest, but was not a fan of the collar on this. It was also a little stiff and didn't really lay flat on the back at the shoulders. It kindof bubbled out. Rated 5 out of 5 by Pammy from Really nice! This gilet is perfect under my winter coat for really cold days or under a flannel shirt for warmer days. Very comfortable....very toasty warm for such a lightweight garment.